Magdalen Libraries and Archives are delighted to announce the opening of our new exhibition. Lawrence of Oxford, opening to the public on 7 November in the Old Library, marks the culmination of two years’ intensive collecting around one of Magdalen’s most celebrated Old Members, T.E. 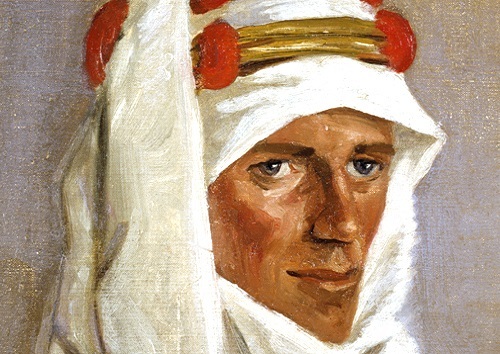 Lawrence (better known as ‘Lawrence of Arabia’). It is a little-known fact that Lawrence was elected to a Senior Demyship at Magdalen in late 1910, and trained as an archaeologist on a British Museum dig in northern Syria as a member of the College until 1914 when the war broke out. Co-curated by Dr. Rory McCarthy (Fellow by Examination) and Daryl Green (Librarian), Lawrence of Oxford will explore the influence Magdalen and Oxford had on this enigmatic figure’s early life. It will look at his efforts in the Arab campaign during the First World War, and his later political involvement with the region. It will also examine his work as an author, and those in Oxford whom he directly influenced. New display cases in the Old Library have allowed us, for the first time, to loan in items of national significance from institutions and private collections. The cases will feature archaeological remains excavated by Lawrence, stamps designed by Ronald Storrs and Lawrence for the independent Hejaz state, original manuscripts and letters from Lawrence, maps which influenced Lawrence’s career (as well as those drawn by him), letters and medals from fellow Arabist Sir Wilfred Thesiger, and much more. There will also be some exhibits owned by the Lawrence Society in view, such as Lawrence’s camera. The exhibition will open to the public on 7 November 2018 and will run until 1 May 2019. The exhibition in the Old Library is normally open on Wednesday afternoons from 2-4:30pm, however private viewings and group tours can be arranged by appointment. A series of events have been programmed to run concurrently with the exhibition (details below). Please contact [email protected] to RSVP (events are free but seat reservations are essential).